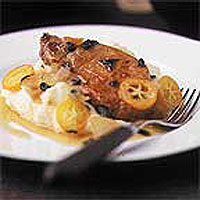 Pork with cider is a classic combination, but adding kumquats and marmalade give this dish an unusual sweet twist. Serve with mashed potato. Preheat the oven to 180°C, gas mark 4. Season the pork with freshly ground black pepper. Heat the oil in a large flameproof casserole and fry the pork steaks for 2-3 minutes on each side until well browned. Transfer to a plate and set aside. Add the onion and kumquats to the casserole and fry over a low heat for 3-4 minutes until beginning to brown. Remove the fat from the pork steaks then return to the pan, pour over the cider and stir in the marmalade. Bring to the boil, stir in the sage and season lightly. Cover the casserole with a tight fitting lid and bake in the oven for 15-20 minutes, or until the pork is thoroughly cooked and the juices run clear. Remove the pork steaks from the casserole and keep warm. Bring the cooking liquid to the boil on the hob and boil rapidly for 2 minutes to reduce it by half. Return the pork to the pan and heat through for 1 minute before serving with 100g mashed potato per person. Cooking pork steaks with the fat on stops them from drying out. Simply trim off before eating. You can replace the kumquats with clementines. Cut the whole fruit into 1cm dice and fry with the onion.